Download our mobile app and unlock special features and pricing. Get it free for your iPhone or Android device. 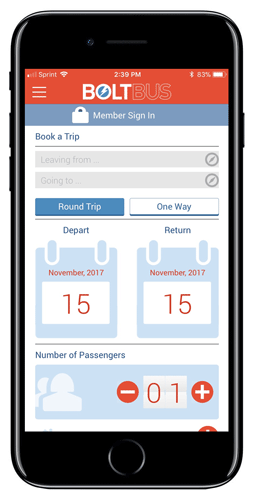 Find schedule and price information to book your tickets on the go. Our BoltBus Rewards program opens a world of features like huge discounts, personal dashboards for managing your trips, and access to paperless E-Tickets Sign Up now! See your upcoming and past trips. You'll can also easily find station locations information and contact details. You can track your bus in real time directly from the App and always be in the know about the expected departure and arrival times for your trip. No more dealing with paper, just flash your mobile E-ticket and board the bus. Making bus travel faster and easier than ever before! The App allows you to redeem those points, that you have worked so hard to earn, for free trips.